LinkedIn offers a great, easy and inexpensive way to build up your professional network and make it work for your business. The key is to connect in the right manner with the right people. LinkedIn offers a great way to build up your network and make it work for your business. 1. Conduct appropriately targeted searches. First, you probably want to sign up for a LinkedIn Premium account, because you’ll get bigger and better search results that way. However, you can do most of the below with just a free account. LinkedIn’s “advanced search” feature allows you to locate potential customers (i.e., connections) using criteria such as vertical industry, geographical location, job title, and so forth. The easiest way to locate potential customers is search on the basis of where and to whom your product has sold in the past. To do this, look up your former customers! See how they’re listed and use that as the model to find similar customers. 2. Send meaningful connection requests. Set aside five minutes every morning with the goal of sending out 10 to 20 targeted LinkedIn connection requests to the people whose names pop up as the result of your targeted searches. The trick here is to write a “connection request” that immediately and succinctly provides a personal benefit to that person of why he or she would want to connect with you. What you don’t want to do is to sound like every other salesperson. With some research (on the targeted “suspect”) and the right message, you should be able to add 10 to 50 new prospects a week. That’s pretty darn good when compared with other lead-generation methods. 3. Create a LinkedIn group for your connections. Your own targeted LinkedIn group is a place where your contacts can visit, post questions, and seek help. In essence, such a group makes it absurdly easy for your prospects to ask your advice–always a good thing. The group also gives you the ability to send out periodic emails to your prospects. 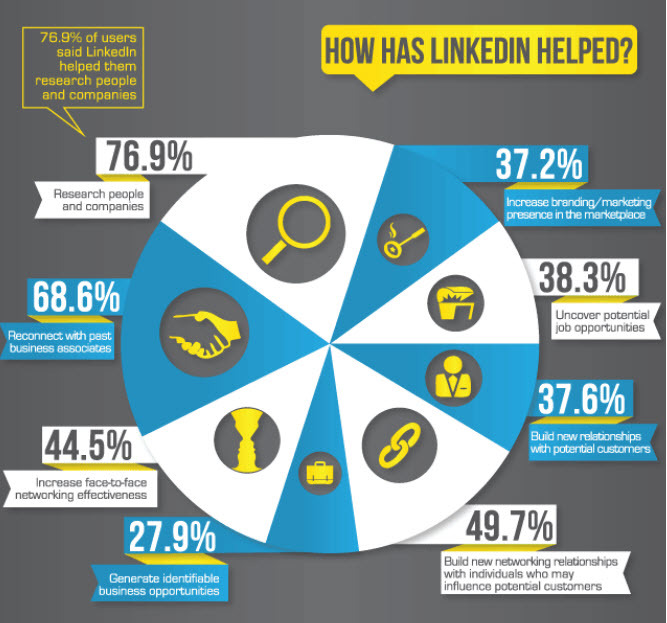 What else have you been doing with LinkedIn that helped your business grow? Share your thoughts with the community, using the comment widget below!